Our current opendap server is not yet configured for netCDF 4. CoRTAD is available via opendap through the THREDDS server above. The Coral Reef Temperature Anomaly Database (CoRTAD) is a collection of sea surface temperature (SST) and related thermal stress metrics, developed specifically for coral reef ecosystem applications but relevant to other ecosystems as well. The CoRTAD Version 5 contains global, approximately 4 km resolution SST data on a weekly time scale from 1982 through 2012. The purpose of the CoRTAD is to provide sea surface temperature data and related thermal stress parameters with good temporal consistency, high accuracy, and fine spatial resolution. The CoRTAD is intended primarily for climate and ecosystem related applications and studies and was designed specifically to address questions concerning the relationship between coral disease and bleaching and temperature stress. Like its previous version (CoRTAD 4), CoRTAD 5 is derived from Pathfinder 5.2 Sea Surface Temperatue as well, while CoRTAD 3 utilized Pathfinder 5.1 and 5.0. CoRTAD 5 has 22 extra months of data and was developed using 1982-2012 data from the Pathfinder Version 5.2 collection produced by the National Oceanic and Atmospheric Administration's (NOAA) National Centers for Environmental Information (NCEI) (http://pathfinder.nodc.noaa.gov). These SST data are derived from the Advanced Very High Resolution Radiometer (AVHRR) sensor and are processed to a resolution of approximately 4.6 km at the equator. These data have the highest resolution covering the longest time period of any satellite-based ocean temperature dataset. Daytime and nighttime data were averaged weekly using data with a quality flag of 4 or better. Previous versions of CoRTAD (versions 1-3) also incorporated pixels up to 5 degrees warmer than a course resolution reference SST based on the Reynolds Optimum Interpolation Sea Surface Temperature (Weekly, 1-degree OISST version 2.0). Since Pathfinder Version 5.2 already uses a finer resolution reference field (25 km Daily OISST) this additional step was not incorporated here in CoRTAD Version 5, or in the previous CoRTAD Version 4. These processes resulted in a weekly SST dataset that is roughly 80% gap free. Please note in both CoRTAD Versions 4 and 5, a gap exists in the Pathfinder 5.2 dataset from 1994 day 275 to 1995 day 17 since Level 1B GAC data from NOAA-9 is not available from the NOAA archives. For these 3.5 months, SST has been interpolated from Pathfinder 5.0 and 0.17K is subtracted to transform the data to the skin temperature basis of Pathfinder 5.2. In CoRTAD Version 5, the data are not stored in separate geographic tiles like in Version 4 and earlier. Instead, each data file contains the entire global coverage for a related grouping of CoRTAD parameters. In addition to SST, the CoRTAD contains SST anomaly (SSTA, weekly SST minus weekly climatological SST), thermal stress anomaly (TSA, weekly SST minus the maximum weekly climatological SST), SSTA Degree Heating Week (SSTA_DHW, sum of previous 12 weeks when SSTA >= 1 degree C), SSTA Frequency (number of times over the previous 52 weeks that SSTA >= 1 degree C), TSA DHW (TSA_DHW, also known as Degree Heating Week, sum of previous 12 weeks when TSA >= 1 degree C), and TSA Frequency (number of times over previous 52 weeks that TSA >=1 degree C). The CoRTAD was created at the NOAA NCEI with support from the NOAA Coral Reef Conservation Program. Selig, E.R., K.S. Casey, and J.F. Bruno (2010), New insights into global patterns of ocean temperature anomalies: implications for coral reef health and management, Global Ecology and Biogeography, DOI: 10.1111/j.1466-8238.2009.00522.x. A few selected graphics showing the mean, minimum, and maximum temperatures from the CoRTAD are shown below to give a small glimpse into the database. Click on the graphic for an expanded view, or follow the link below the graphic to display the full resolution TIFF version. The CoRTAD is a large and extensive collection of data. At the end of this page, a listing of the files making up the CoRTAD along with their sizes is provided. Version 1 is in HDF4-SDS format while Versions 2 and 3 are in HDF-5 and for Version 4 and 5 the data is in NetCDF format. See the Satellite data formats page for more information. Currently, a major gap exists from 1994275 to 1995017 in Pathfinder 5.2. In addition it has been determined that 1994256 to 1994274 Pathfinder 5.2 have few observations. This is because complete Level 0 or Level 1 GAC data from NOAA-9 have not yet been found. CoRTAD version 5 uses Pathfinder 5.0 sst data from 1994256 through 1995017. 0.17K is subtracted from the 5.0 pathfinder as 5.2 represents skin temperature as opposed to bulk temperature. For more information, please contact the NCEI.info@noaa.gov. Hoff, M. (2007). What's Behind the Spread of White Syndrome in Great Barrier Reef Corals? PLoS Biol 5(6): e164 (DOI: 10.1371/journal.pbio.0050164). Kristiansen, T., H. Wehde, J. Albretsen, and M.D. Skogen, (2014). QUALITY INFORMATION DOCUMENT For Northwest Shelf Physical and biological Reanalysis Products NORTHWESTSHELF_REANALYSIS_PHYS_004_010 NORTHWESTSHELF _REANALYSIS_BIO_004_012. McLeod, Elizabeth, Russell Moffitt, Axel Timmermann, Rodney Salm, Laurie Menviel, Michael J. Palmer, Elizabeth R. Selig, Kenneth S. Casey, and John F. Bruno, (2010) 'Warming Seas in the Coral Triangle: Coral Reef Vulnerability and Management Implications', Coastal Management, 38: 5, 518-539, First published on: 26 August 2010 (iFirst), DOI: 10.1080/08920753.2010.509466. URL: (DOI: 10.1080/08920753.2010.509466. Pirhalla D.E., V. Ransibrahmanakul, R. Clark, A. Desch, T. Wynne, and M. Edwards. 2009. An Oceanographic Characterization of the Olympic Coast National Marine Sanctuary and Pacific Northwest: Interpretive Summary of Ocean Climate and Regional Processes Through Satellite Remote Sensing. Prepared by NCCOS's Coastal Oceanographic Assessments, Status and Trends Division in cooperation with the National Marine Sanctuary Program. Silver Spring, MD. NOAA Technical Memorandum NOS NCCOS 90. 53 pp. Selig, E.R., C.D. Harvell, J.F. Bruno, B.L. Willis, C.A. Page, K.S. Casey and H. Sweatman (2006). Analyzing the relationship between ocean temperature anomalies and coral disease outbreaks at broad spatial scales. In; J.T. Phinney, O. Hoegh-Guldberg, J. Kleypas, W. Skirving, and A. Strong (eds.). Coral reefs and climate change: science and management. American Geophysical Union, Washington, DC, Pages 111-128. NOAA National Centers for Coastal Ocean Science (NCCOS) 2005. A Biogeographic Assessment of the Channel Islands National Marine Sanctuary: A Review of Boundary Expansion Concepts for NOAA's National Marine Sanctuary Program. Prepared by NCCOS's Biogeography Team in cooperation with the National Marine Sanctuary Program. Silver Spring, MD. NOAA Technical Memorandum NOS NCCOS 21. 215 pp. NOAA National Centers for Coastal Ocean Science (NCCOS) 2007. A Biogeographic Assessment off North/Central California: In Support of the National Marine Sanctuaries of Cordell Bank, Gulf of the Farallones and Monterey Bay. Phase II - Environmental Setting and Update to Marine Birds and Mammals. Prepared by NCCOS's Biogeography Branch, R.G. Ford Consulting Co. and Oikonos Ecosystem Knowledge, in cooperation with the National Marine Sanctuary Program. Silver Spring, MD. NOAA Technical Memorandum NOS NCCOS 40. 302 pp. 14 February 2008 - In the News! Benjamin S. Halpern, Shaun Walbridge, Kimberly A. Selkoe, Carrie V. Kappel, Fiorenza Micheli, Caterina D'Agrosa, John F. Bruno, Kenneth S. Casey, Colin Ebert, Helen E. Fox, Rod Fujita, Dennis Heinemann, Hunter S. Lenihan, Elizabeth M.P. Madin, Matthew T. Perry, Elizabeth R. Selig, Mark Spalding, Robert Steneck, Reg Watson (2008). 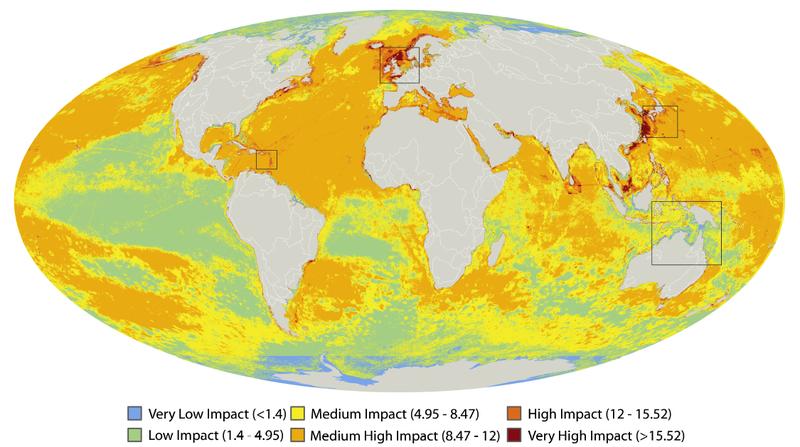 A global map of human impact on marine ecosystems. Science, vol. 319, no. 5865, pp. 948-952 (DOI: 10.1126/science.1149345). The study reveals that over 40% of the world's oceans are heavily affected by human activities and few if any areas remain untouched. These results are illustrated in the image above, adapted from Figure 1 of the paper. In the image, cooler shades (blue to green) represent areas with lower levels of human impact. Warmer shades (yellow to red) represent areas with higher levels of human impact. The project is the first global-scale study of human influence on marine ecosystems.